Given that it’s mid-term break and the summer season is fast approaching, this is a good time to look at the role and importance of the tourism sector in the economy of the Western Region. Because of its importance as a source of demand for the hospitality industry, though the balance between tourist and local demand varies considerably across the region, our recent publication ‘Accommodation & Food Service Sector in the Western Region: Regional Sectoral Profile’ included a section examining tourism data. This post looks at visitor numbers and revenue from both overseas and domestic tourists visiting the Western Region. The data is from various Fáilte Ireland reports on regional tourism performance. In 2016 overseas tourists visiting the Western Region generated total revenue of €838m. This was 18.1% of total overseas tourism revenue generated in the state in that year. The largest source of overseas tourism revenue for the Western Region is North America (35.4%), considerably higher than this market’s share nationally (Fig. 1). The next largest is Mainland Europe which accounted for a somewhat lower share in the region than nationally. 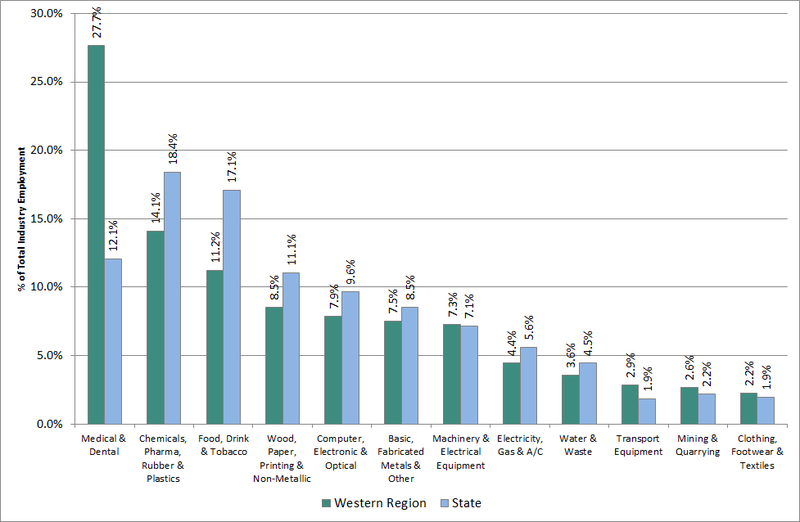 The region differs considerably from the state in the lower share coming from ‘Other Areas’ (e.g. Asia, Australia). 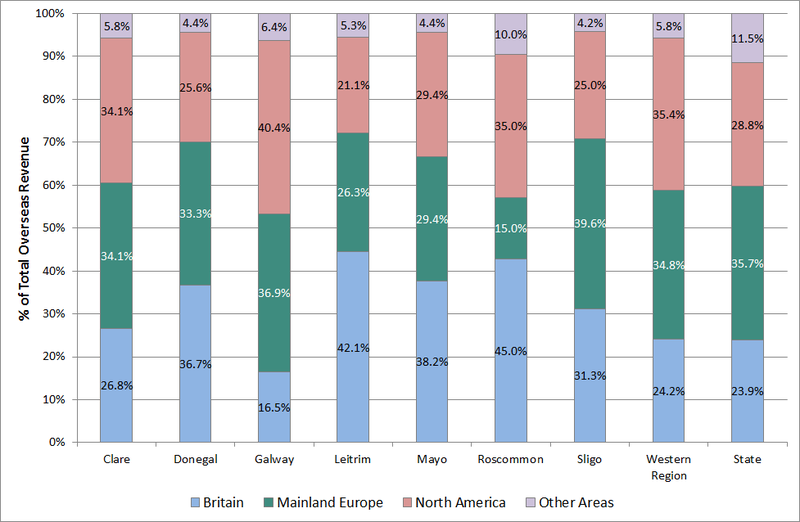 It seems that visitors from emerging and long-haul markets are less likely to visit the region than elsewhere in Ireland. A key factor in this is access. As international air carriers from these locations fly in to Dublin Airport, increasing road, rail and bus accessibility from Dublin to the region is vital to growing visits from these new markets. The relative importance of different markets varies across counties. Britain is the largest source of overseas tourism revenue for Roscommon, Leitrim, Donegal and Mayo. This is influenced by their large diasporas in the UK as well as direct UK flights to Ireland West Airport Knock, Donegal Airport and City of Derry Airport. For Roscommon and Leitrim it may also reflect their lower profile among visitors from the US or Europe. The tourism sector in these four counties is therefore quite exposed to the impact of Brexit. 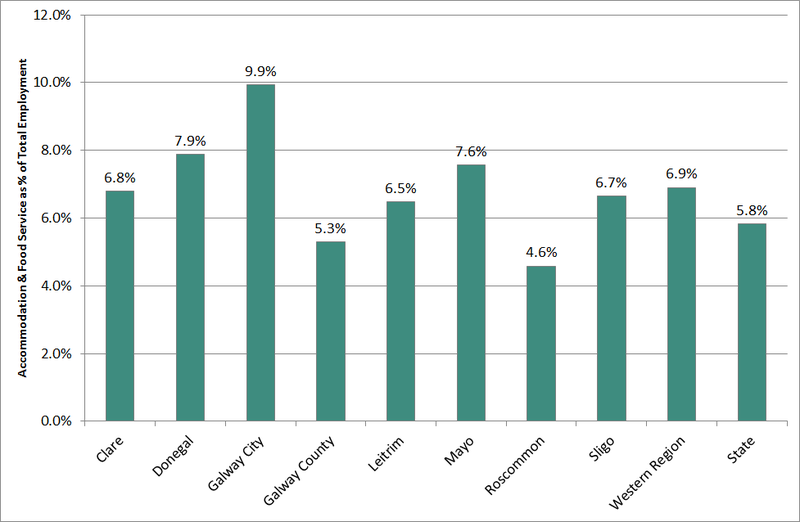 North American visitors are the largest source of revenue for Galway and Clare (jointly with Mainland Europe) reflecting these counties’ position as international tourist destinations, with direct flights to Shannon Airport playing a role. Between 2011 and 2016, total overseas tourism revenue generated in the Western Region grew by 35.8% compared with 58.9% nationally (Fig. 2) showing a somewhat lower level of recovery. While it is not possible to calculate total overseas tourist numbers for the Western Region as a whole due to double-counting, all western counties experienced growth in visitor numbers. Overseas visitor numbers grew by 38%-58% in Donegal, Clare, Galway and Leitrim and these four counties also showed the strongest revenue growth. They also had the strongest hospitality jobs growth over the same period clearly illustrating the strong link between overseas tourism and hospitality employment. 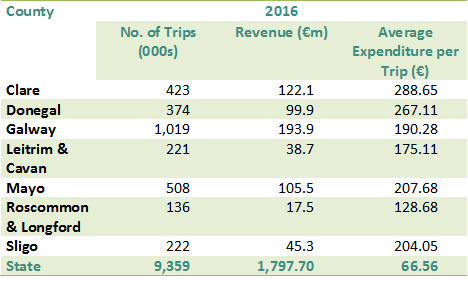 Donegal experienced substantially greater revenue growth than numbers growth indicating that each visitor spent more per trip (perhaps by staying longer) with Leitrim and Clare also seeing higher spend per overseas visit. In contrast, Galway had lower growth in revenue than numbers with its growing popularity as a ‘city-break’ destination leading to more, but shorter, visits. 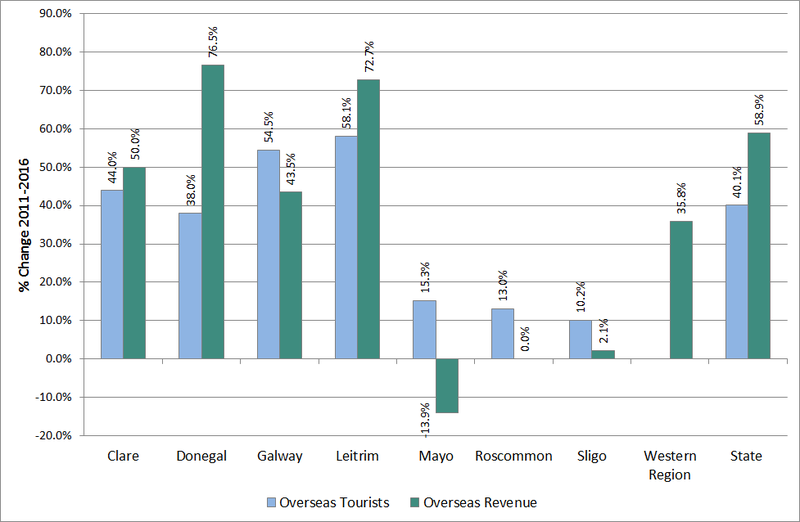 Mayo was the only county to experience a fall in overseas tourism revenue (-13.9%) despite growth in tourist numbers, indicating that average spend per visit declined. The ageing of the large Mayo diaspora in the UK, reducing revenue from ‘visiting friends and relatives’, could be a factor. 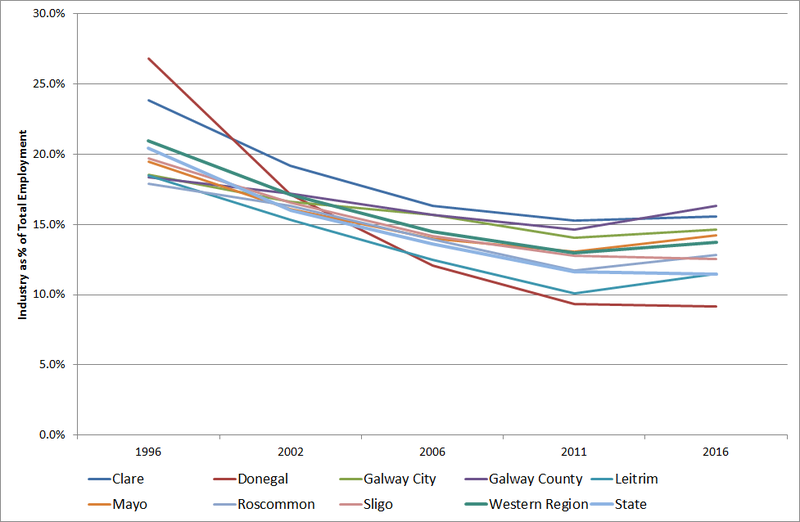 Roscommon and Sligo also saw a decline in spend per visit. The substantial reduction in average hotel prices during this period would have contributed and this may have been more prevalent in these counties. Domestic tourism plays a key role in the region. 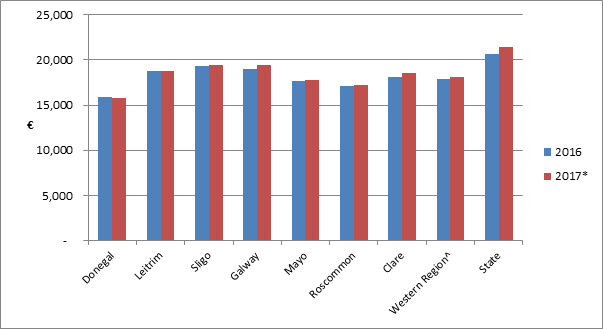 In 2016 Galway received over 1 million domestic trips with Mayo and Clare next highest (Table 1). 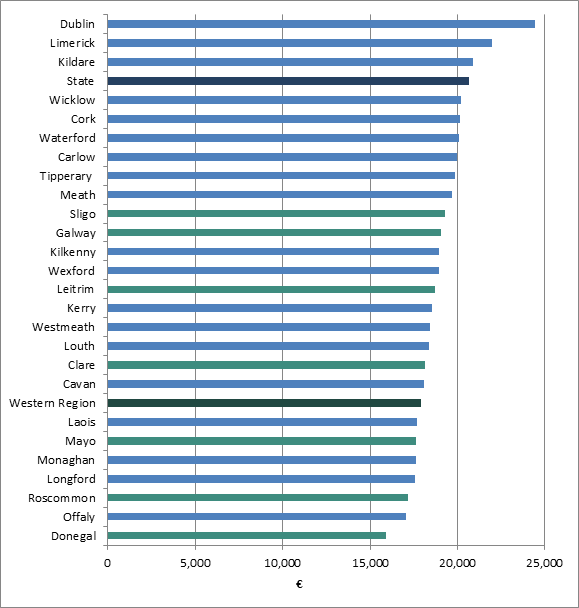 Given low numbers, data for some counties is amalgamated in the published data and Roscommon & Longford received 136,000 domestic trips in 2016, the lowest number in Ireland. The revenue generated from domestic trips ranged from €17.5m in Roscommon & Longford to €193.9m in Galway. In terms of the average expenditure per trip, counties Clare and Donegal generate notably higher spending per domestic trip. This might be because domestic trips to these counties tend to be for a longer duration and/or people engage in more activities (are holidaymakers). 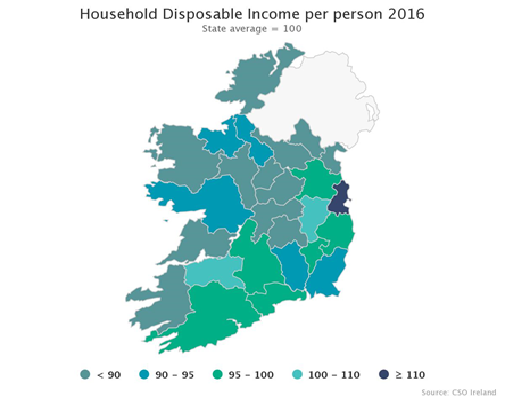 The more inland areas (Roscommon & Longford and Leitrim & Cavan) have lower average spend per trip which could be because stays in these areas tend to be shorter, are more commonly to visit friends or family and/or costs are lower. 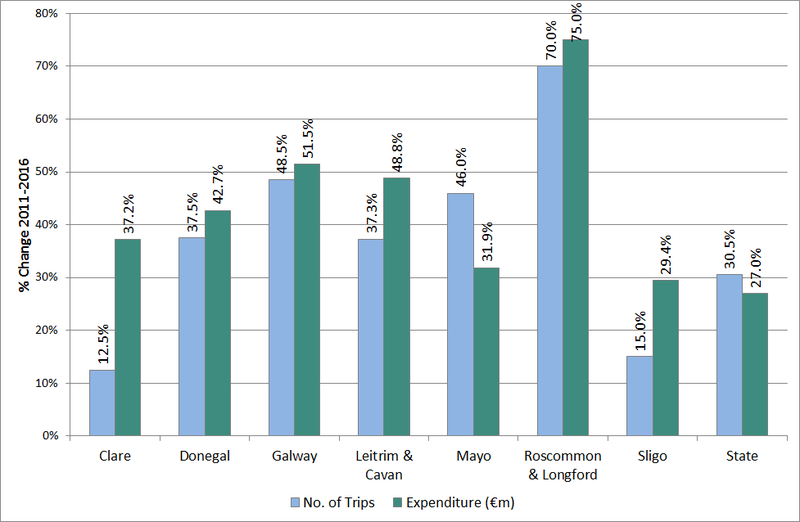 Galway’s relatively low spend per trip is likely influenced by short ‘city-breaks’. As economic conditions improved and disposable income recovered, the number of domestic trips taken in the state grew by 30.5% between 2011 and 2016 with the revenue generated by such trips increasing by 27%, indicating some reduction in spend per trip (Fig. 3). Except for Mayo, all western counties had the opposite pattern, with greater revenue growth than growth in domestic trips with higher spend per trip. 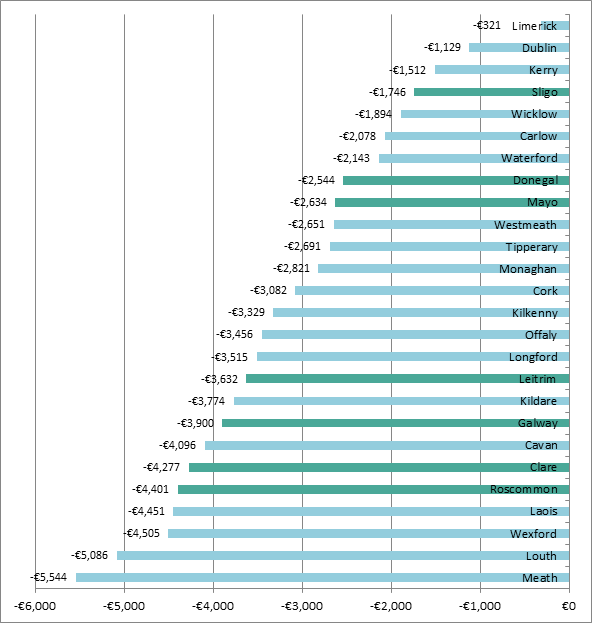 Clare, Leitrim & Cavan and Sligo in particular had notably higher revenue than numbers growth. 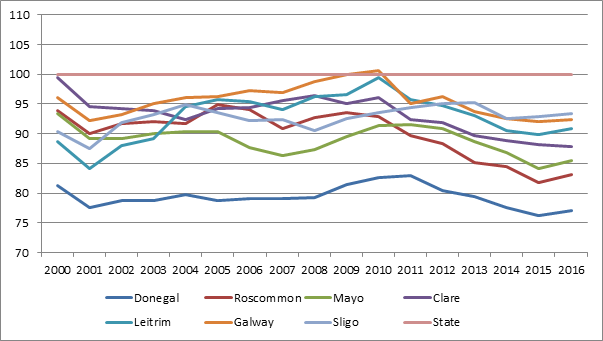 Roscommon & Longford had the strongest growth in both numbers and revenue, though from a very low base. This growth was far stronger than the performance of overseas tourism over the same period in Roscommon meaning Irish tourists now play a larger role in Roscommon’s tourism activity. 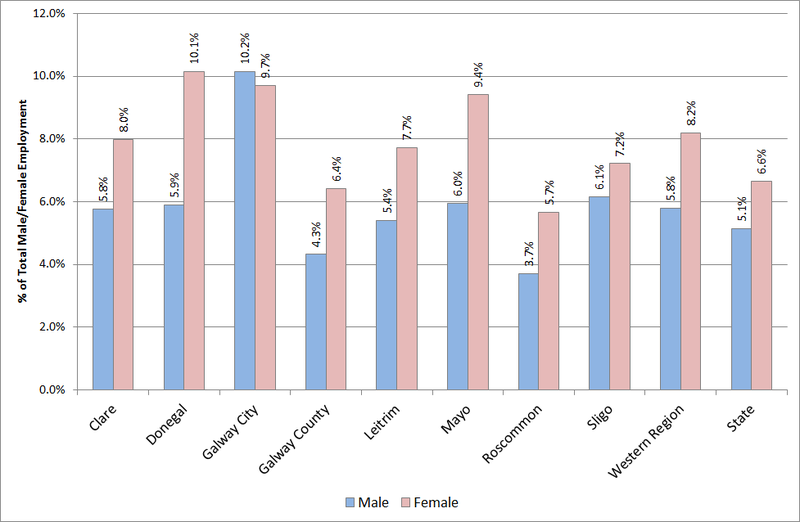 Galway and Mayo had the next strongest growth in tourist numbers influenced by Wild Atlantic Way marketing, initiatives such as the Mayo Greenway and the popularity of Galway City and Westport in particular for short breaks. 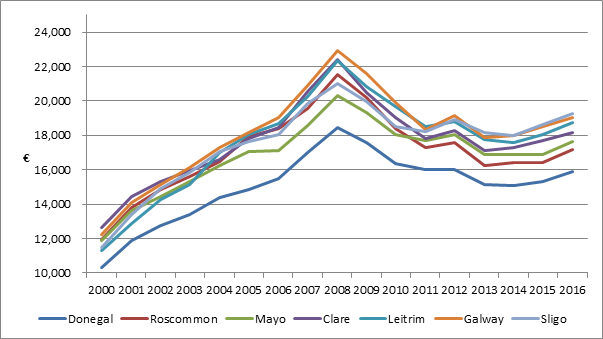 For Mayo, domestic trips out-performed overseas, again indicating an increased role for the Irish market, while Mayo’s lower revenue growth is consistent with the pattern for overseas tourists where spending per visit also declined. Tourism marketing brands are critical to attracting domestic and overseas visitors: The Wild Atlantic Way brand has increased tourist numbers and hospitality employment in counties along its route with Donegal, Clare and Galway seeing particularly strong jobs growth. The continuation, strengthening and extension of the WAW marketing brand is important for sustaining and growing the sector along the western seaboard. The 2018 launch of the new Ireland’s Hidden Heartlands marketing brand is hoped to increase tourist numbers and revenue to the more inland areas of the Western Region. While Leitrim has performed well in recent years with strong employment and visitor growth, Roscommon has performed quite poorly; both rely heavily on the UK market. Careful monitoring of the impact of the Ireland’s Hidden Heartlands marketing will be required to judge its effectiveness, with adjustments made as needed. Need to adapt to tourism trends: A number of trends will impact on the future of tourism in the Western Region. For example the emergence of ‘sharing economy’ models such as Airbnb is already having an impact. This can facilitate visitors to stay in more rural areas where there may be insufficient demand for other types of accommodation but where visitors can bring benefits to the wider economy. This trend however may also impact on the employment levels of accommodation providers. Changing demographics such as the ageing profile of the European market as well as the UK and US based Irish diaspora, alongside strong global tourism growth from Asian markets, will alter the profile, nature and requirements of overseas tourists to the Western Region and its hospitality sector will need to adapt. The transition to a low carbon economy will also impact on tourism with potential reduction in air travel, increased focus on the use of public transport by tourists and a demand for higher environmental standards within the sector. The Western Region’s ‘green’ image provides an important marketing tool, however Ireland’s island location and reliance on air access means that any reduction in air travel to mitigate its negative climate impacts could have a significant impact on tourism in the region. Latest data available. While some topline county data is available for 2017, it does not include a breakdown by market. Not including revenue from Northern Ireland, carrier receipts (payments to Irish airlines/ferry companies by tourists coming into the country) or overseas same-day visits. County data is based on a three-year rolling average so the figures for a particular year represent their ‘average’ performance for the previous three years. This was also the case for Longford.